How many times since childhood have we fallen, hit our siblings, or hurt ourselves to the point where we start bleeding? The minute we see red blood oozing out, fights come to a halt and our effort goes into making the bleeding stop. We all know the basics for that–apply pressure to the wound, and if you’ve hurt your hand or finger, hold it above your heart so blood ceases to flow against gravity, etc. However, apart from these rudimentary efforts, there’s an entire mechanism in place that prevents us from bleeding out from a single cut. This mechanism is set in motion as soon as an injury happens and will spontaneously cause you to stop bleeding. 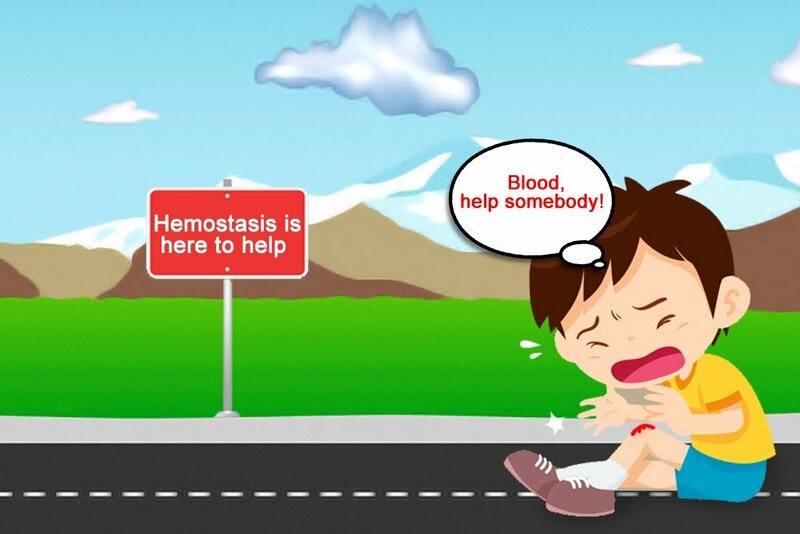 This arrest or stoppage of bleeding is called hemostasis, where “heme” means blood and “stasis” means stoppage. When a particular blood vessel is damaged, the cells lining the blood vessel release chemicals called endothelins, which cause the smooth muscles of the blood vessels to contract and restrict the flow of blood from the damaged portion of the vessel. This constriction occurs right at the site of the damaged blood vessel. Another factor that plays a role here is platelets. All blood vessels are lined by a layer of cells called the endothelium; when there is an injury to a vessel, the endothelium is damaged and collagen from the vessel is exposed. Platelets have a natural tendency to adhere to this collagen and release serotonin and other substances, all of which tend to cause vasoconstriction of the vessel wall. Serotonin, which helps vasoconstriction and the restriction of blood flow. Adenosine diphosphate (ADP) and thromboxane A2, both of which attract more platelets to the site and activate them, thereby promoting platelet plug formation. 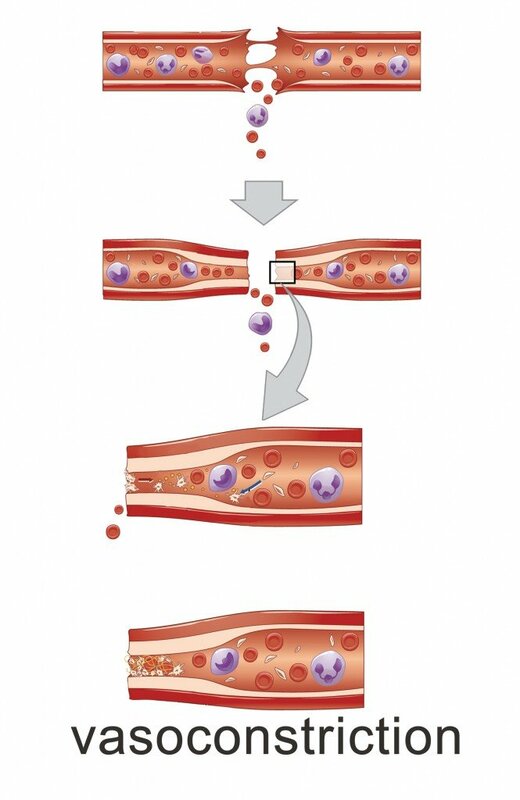 This entire process is facilitated by the platelet-activating factor (PAF) and is also referred to as platelet-mediated primary hemostasis, which is often our first line of defense following an injury. While primary hemostasis with platelets is essential, it doesn’t usually suffice, so the site of the injury needs to form a blood clot. Coagulation or the clotting of blood is the process by which blood loses its fluidity and turns into a jelly-like mass or clot. To understand coagulation better, let me start from the end! The final step of this mechanism is the formation of a fibrin mesh. Now, fibrin is a protein with a natural tendency to stick together and form strands of fibrin, which eventually grow into a mesh. Now, if fibrin naturally has a tendency to stick together and form clots, then would it do so even without an injury to the blood vessel? Wouldn’t that lead to multiple spontaneous blood clots that could kill us? Well, logic and evidence argue that fibrin doesn’t always exist in its “I will stick to other fibrin proteins” state and instead exists in an inactivated state. This inactivated state is called fibrinogen. Think of inactivated fibrinogen as a toy soldier with a lock; as long as the lock is in place on the toy soldier, it remains as it is. However, the minute the lock is undone, the toy soldier (in this case fibrinogen) becomes activated and forms fibrin, which then sticks together and forms a clot. There are a number of clotting factors involved in the pathways through which the cascade reactions occur. In all, there are 13 factors, most of which are named after the scientists who discovered them or their actions. Most of these are proteins and exist in their inactive state as proenzymes. The extrinsic pathway, also known as the tissue factor pathway, begins when a traumatic injury occurs from outside the blood vessel. There is a particular protein called the tissue factor (TF) that exists outside the blood vessels. Upon damage to the blood vessel, TF combines with plasma proteins and converts Factor VIIto VIIa. This is the first step of the cascade, which further activates Factor IX and Factor X, converting them to IXa and Xa. This factor Xa reacts with Factor II, i.e. prothrombin, in the presence of Factor Va and produces Factor IIa or thrombin. We know that fibrin formation is the ultimate goal of this cascade, but thrombin is what catalyzes fibrinogen to form fibrin. The intrinsic pathway is triggered by trauma that occurs inside the blood vessels and is activated by platelets, collagen, the exposed endothelium of the blood vessels and clotting factors. 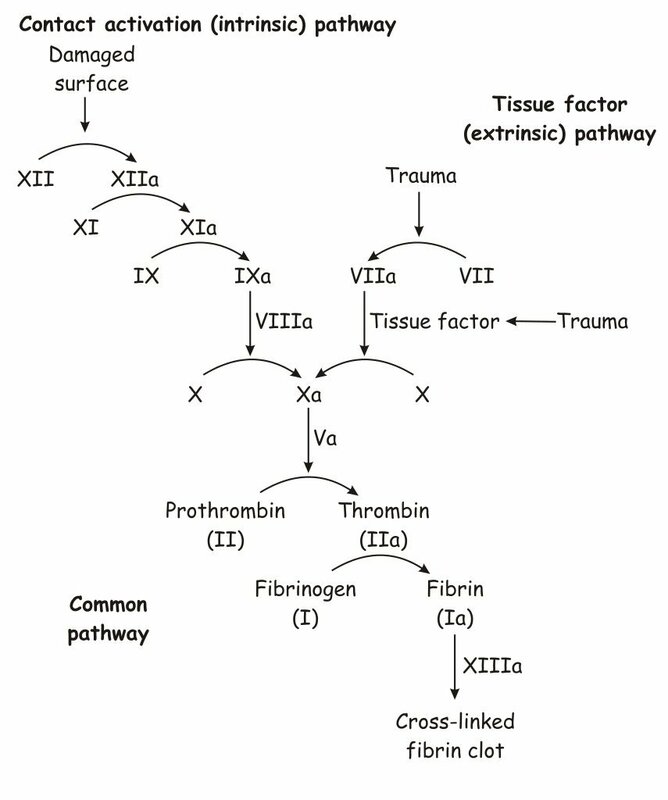 In the intrinsic pathway, the thrombin formed in the above cascade (extrinsic pathway) acts on Factor VIIIto form factor VIIIa. This activated factor VIIIa forms a complex with activated factor IXa and this complex triggers the continuous formation of thrombin, meaning that there is a constant supply of thrombin to enable the conversion of fibrinogen to fibrin. This fibrin is essential for the formation of a blood clot and eventually enables hemostasis. Both of these will eventually meet and complete clot production through a common pathway. To conclude this discussion, it’s fair to say that it is difficult to imagine such a complex, sophisticated and multi-staged mechanism being pushed into action the minute we inflict a tiny prick on our finger. Sometimes, if this process doesn’t run smoothly, we may end up suffering from bleeding disorders like hemophilia, purpura, or von Willebrand disease, all of which affect our clotting time in various ways and result in excessive bleeding after even minor injuries.